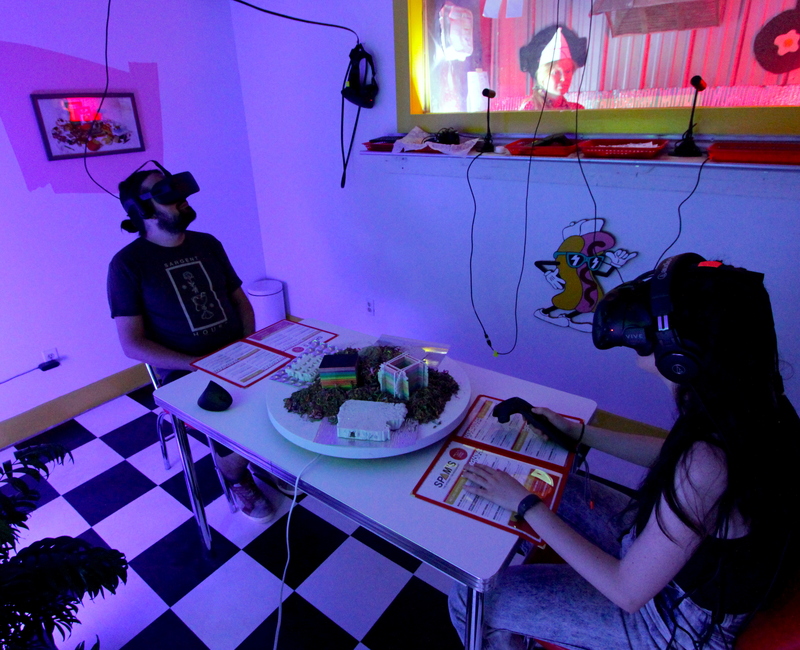 Spam’s is a post-retro-futurist virtual reality dining experience. 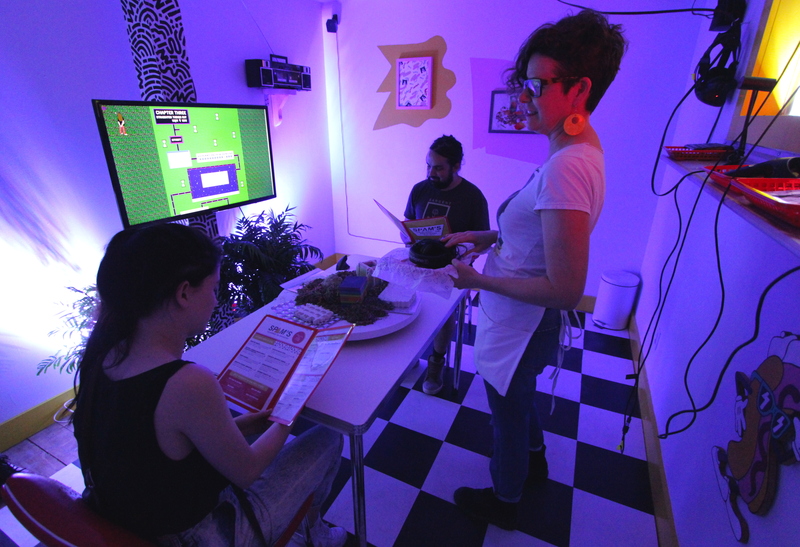 Visitors make a reservation and choose their appetizer, entree, and dessert from a menu of interactive net.art and experimental VR experiences. Our kitchen has cooked up an extensive array of local and international offerings, ranging from greasy-spoon VR junk food to farm-to-table digital artistry. *We only serve cage-free, no MSG, but heavily GMO artwork at Spam’s. *Spam’s does not serve actual food. Sultana’s Reality is a multimedia web story about the historical relationship between women and books in India. The project is in the form of a website where the viewer can work their way back and forth through time in a linear or a non linear trajectory. The story is told through videos, gifs, comics, cards and hidden notes. The material in the story is a remix of women’s textual history, oral history and archival images of women from some of the oldest collections in the country housed at the Centre for Studies in Social Sciences, Calcutta. Ambar Navarro is an artist based in Los Angeles, CA originally from San Antonio, TX. She moved to California to pursue a degree in Experimental Animation from CalArts and creates films, animations, and photographs. Her and her work mostly live online but sometimes she goes out and has work in galleries too. Tiny Ode to Rafman is a miniature scaled computer area inspired by Jon Rafman’s still lifes of messy work stations. ARCOS experiments rigorously to discover adventurous new forms of contemporary performance—inspired by questioning dominant understandings of the world, turbulent processes of traditions in flux, and the complexity of being human today. They have presented at festivals, won awards and received grants recognizing their work, and participated in residency at colleges, universities, and arts institutions around the country. ARCOS also offers professional-level training classes, performance intensives, development workshops, and microgrants to independent artists and youth. 🕛🕧(twelve-twelve-thirty): A site-specific performance that puts the viewer in the hands and subjectivity of a person who awakens in a mysterious place, explores her surroundings, encounters others, and searches for an exit. Benjamin Rosenthal holds an MFA in Art Studio from the University of California, Davis and a BFA in Art (Electronic Time-Based Media) from Carnegie Mellon University. His work has been exhibited internationally in such venues as the Stuttgarter Filmwinter (Stuttgart, Germany), FILE Electronic Language International Festival (São Paulo, Brazil), Vanity Projects (New York, NY), the Museum of Contemporary Art of Vojvodina (Novi Sad, Serbia), and online via the Istanbul Contemporary Art Museum (Is.CaM), among others. Pulling from a variety of fields in the humanities and sciences, he questions the authenticity of our physical experience in an age where the boundaries between reality and the virtual become indistinguishable. Rosenthal is Assistant Professor of Expanded Media, in the Department of Visual Art at the University of Kansas where he teaches Video Art, Performance Art, and interdisciplinary practices. Administrative Maximum: Towards the End of the Broadcast is an interactive web project that investigates issues of control, desires for mediated violence, and the nature of the voyeuristic impulse in a culture where technology both limits autonomy and provides for unmitigated possibilities for utopian agency in the world of digital fantasy. An aggressive and oversaturated network of stimuli and possible performance strategies, the viewer is given moments of choice only to be thwarted by predetermined outcomes that reveal the impossibility of winning. The site is developed from several hundred pages of interactive flash animations and games, live video feeds combed from the internet, and sound. Blake Kathryn is a multidisciplinary designer and content creator with a passion for patterns, shapes, and vibrant colors. She resides in sunny Los Angeles by way of Florida and New York. In her offline time you’ll likely find her dreaming of sushi burritos, or conjuring up visual experiments. Brenna Murphy (b. 1986, Edmonds, WA) is an American artist based in Portland, Oregon. She has exhibited work at the New Museum First Look and James Cohan, and has had solo shows with Kunstverein Dusseldorf, Yerba Buena Center for the Arts, and Future Gallery. She is represented by American Medium and Upfor. Her work has been published in the books SKYFACE SENSRMAP, Central Lattice Sequence, and the monograph Domain~Lattice, and she is the recipient of grants from RACC, Rhizome, and the Oregon Arts Commission. With artist Birch Cooper, she performs as MSHR, which constructs sculptural synthesizers, ritualistic performances, and installations that place the body into a dynamic relationship with sound and light. She holds a BFA from the Pacific Northwest College of Art. Stevijn van Olst is a multidisciplinary interactive thinker, designer and art director schooled in typography with interests in 3D, web technology and gaming. The other half of Cartelle, Johnny Slack, is a creative technologist who specialises in interactive storytelling, WebGL and creative programming. Together they are Amsterdam-based interactive studio, Cartelle. Make My Bread: This piece is dedicated to the haptic satisfaction of the toaster lever. Now that it’s in digital format, everyone can enjoy this feeling forever. The WebGL toaster is achieved with three.js and a real-time physics engine. Sounds are sampled from the Cuisinart CPT-140R. 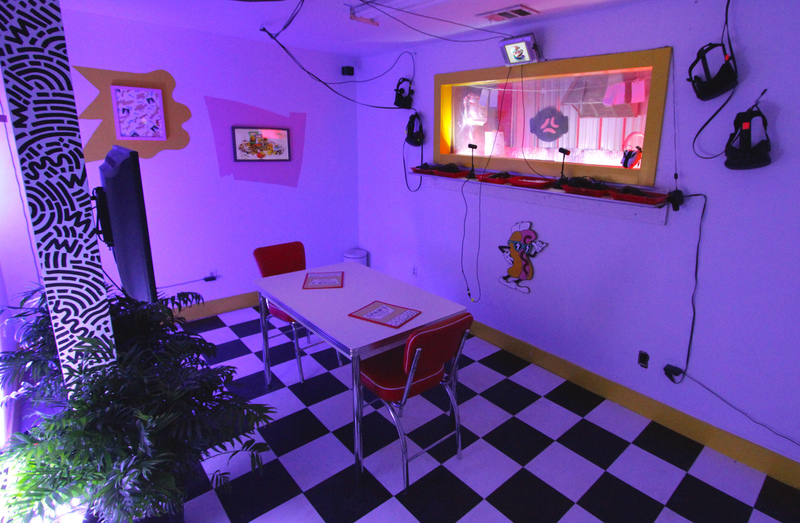 the c̟y͑b̊e̟rtweͤe HQ* is a gallery shooting sugar-spun filaments into the virtual world. Navigate a serene island nestled in the middle of a gleaming mirrored sea under a brilliant night sky. Here you will find a collection of digital works in a vibrant 3d gallery. what if cyberpunk had a younger sister that was secretly better at coding? With that question, the genre of cybertwee was born. beginning as an arts collective and then exploding across social media, a community of people interested in the intersection of cute + tech came together. this digital community needed a digital headquarters, so they built one. Then, they wanted to fill it with beautiful digital things, so naturally they asked the internet. c̟y͑b̊e̟rtweͤe invited artists from all over the world to answer one question with original digital artworks: what is c̟y͑b̊e̟rtweͤe? Alexis Anais Avedisian , Becka Saville , Carolyn Tripp , Corie Denby McGowan , Emily Mulenga , Ethan Tate , Evan Fusco , Gerard Olivier (HELLCOM) , Hana Aoake + Mya Middleton , Ian Honare , Jaana-Kristiina Alakoski , Jasmine Nyende , Jessica Dolence , Lauren Helena May Pelc-McArthur , manuel arturo abreu , Maya Ben David , Miriam Poletti , Ragna Rök Jóns , Rebecca Richards, Reed Hex , Sarah Rooney, & Tobias Williams. Also included are historical works by legendary cyberfeminists VNS Matrix, who wrote the original cyberfeminist manifesto in 1991. THETA (Θ) is a guided meditation virtual reality spa experience founded on principles of sensorial decadence and medical relaxation. Featuring a guided meditation poem by poet Noah Falck. Gracelee Lawrence is currently a Visiting Artist in the Multidisciplinary Department of Art at Chiang Mai University on a Luce Scholars Fellowship and recently completed her MFA in Sculpture + Extended Media at the University of Texas at Austin. She is a Co-Founder/Director of Pig & Pony, the Founder/Director of the Virtual Studio Visit Network, Co-Founder of Cocina Migrante, a contributing writer for the International Sculpture Center Blog, and a member of the collective Material Girls. In 2017 she looks forward to two solo exhibitions in Thailand and has held solo exhibitions across the United States. She is an artist, writer, cook, traveler, macramé enthusiast, lifelong horsewoman, and Bagel Babe. Wax and Wane is a short video depicting the melting of four different sweet treats that have been painstakingly recreated in wax. A reminder that all is not what is seems, time moves slowly as the objects shift from solid to liquid and back again. Jesse Cline is a designer and artist interested in contemporary systems of representation and production, and the consequent appropriation and diversion of those systems. He received his BS in Electronic Media, Art and Communication from Rensselaer Polytechnic Institute, and his MFA in Design from the University of Texas at Austin. #desserts: It is now possible to represent a near-perfect image of the physical world. Objects and environments can be rendered almost omnipotently in spaces that span near-infinity — and then easily materialized right from your print screen. Simultaneously, as a parallel to humans’ inability to perceive the UV/IR spectrum, there are physical materials that seem invisible or disorienting to machines. By processing a variety of these instances I knew to be problematic for data-capture tools to deal with, I generated 3D forms through the extrapolation of hypercomplex surfaces — reflective, intricate, symmetrical. Each resulting gypsum print is the physical distillation of a multi-aspect digital collective; a singular echo of a multitude. Jess Johnson was born in Tauranga, New Zealand in 1979. In 2016 she relocated permanently to New York after ten years of living and working in Melbourne, Australia. Her drawing and installation practice is influenced by the speculative intersections between language, science fiction, culture and technology. In her drawings she de-picts complex worlds that combine densely layered patterns, objects and figures within architectural settings. Johnson’s drawings are often displayed within constructed environments that act as physical portals into her speculative worlds. Her recent video collaborations with Simon Ward have involved translating her drawings into animated Virtual Reality, thus enabled an audiences to have the simulated experience of entering the hypnotic realms depicted in her drawings. Jess Johnson’s work has been exhibited throughout Australia, New Zealand and Internationally where she has participated in solo and group exhibitions at; Jack Hanley Gallery, New York; Art Basel, Hong Kong; Talbot Rice Gallery, Edinburgh; National Gallery of Victoria, Australia; Museum of Contemporary Art, Australia; and Christchurch Art Gallery, New Zealand. Jess Johnson is represented by Jack Hanley Gallery, New York; Darren Knight Gallery, Sydney, Australia; and Ivan Anthony, Auckland, New Zealand. Simon Ward has been based in Wellington, NZ for over ten years, working on large scale feature films such as Lord of the Rings, The Last Samurai and Avatar, and producing more than fifty music videos alongside his musical friends and collaborators (including Le1fand Princess Chelsea). Ward has employed a DIY approach utilizing self-taught effects and animation techniques, his videos mixing reality with psychedelia. Re-cent projects have steered towards broader video forms, working with writer / artist Jessica Hansell to direct two seasons of the cartoon series Aroha Bridge, creating video art works with Bronwyn Holloway Smith, and collaborating with New York-based artist Jess Johnson to create video works and interactive Virtual Reality works. Their first VRartwork, Ixian Gate, premiered at the National Gallery of Victoria, Australia, in early 2016. Ixian Gate was created from high resolution scans of Johnson’s drawings which she produced over an intensive, four year period. Simon Ward turned these scans into an immersive three-dimensional world using the game engine Unity – a software framework designed for the creation and development of video games. Ixian Gate was originally exhibited as the centerpiece of Jess Johnson’s Wurm Haus exhibition at the National Gallery of Victoria, Australia. Joshua Keeney (550am) is a 17 year old artist who primarily works in 3D and has been creating 3D work since 2015. His work is inspired by vaporwave, and cyberpunk elements mixed with high fashion (cyber chic). Neptune Zine is an introduction to the character of Neptune. She is equal parts drama and glamour meets cyberspace. Neptune Zine is the first zine by Joshua Keeney, 550am, and combines new and existing work to introduce the character Neptune. Katie Rose Pipkin is a drawing and language artist from the woods outside of Austin, Texas and currently based in Pittsburgh, Pennsylvania. They produce printed material as books, chapbooks, and zines, as well as digital work in software, bots, and games. They also make drawings by hand, on paper. perfectly emulated human: A web-browser error log is populated by messages of bodily processes, the textual output of a series of programmatical loops. Jimmy Andrews is a computer programmer is San Francisco who enjoys designing playful virtual toys. He is currently making a game about being a tree. Loren Schmidt lives in Pittsburgh, PA and makes games and digital art. Loren loves using this medium to make rich, beautiful, meaningful projects that tell a personal story, experiment with the form, ask hard questions, and push to expand people’s perceptions of what is possible. Realistic Kissing Simulator is a cooperative, goalless kissing simulation game. Two people sit together and contemplate kissing, and if both wish to kiss, a robust kissing simulation is provided. Martha Hipley is an artist and programmer working in digital and paint, occasionally under the brand everyoneisugly. Her work explores identity formation through the lens of fandom culture and nascent sexuality. In addition to being awarded a Rhizome microgrant for her project “Untitled Twitter Hack,” she is also the second best web surfer in the world. ur cardboard pet is a project for Google Cardboard using WebGL and Three.js, as well as hand-painted illustrations. Take the quiz and meet your true digital love (feel free to gaze into his eyes until the end of time). Puppy Sundae is a visual experiment combining chromatic backgrounds, cute animals, and tasty treats to incite the brain’s amygdala and pleasure centers. Metaverse Makeovers® (MM) is an augmented reality glamtech brand. MM is based in Melbourne, Shanghai, Hong Kong, LA, London, and Online. We comprise an interdisciplinary team of artists, technologists, developers, and marketers. Metaverse Nails™ (patent pending) is the only product in the WORLD that allows you to adorn your digital and physical self with customisable holograms. It’s glam wearable tech. Our wearable appcessories are collectible fashion accessories that interact with our Metaverse Nails app, a 3D social app that triggers a dazzling range of futuristic, interactive holograms which can be snapped and shared in real time to social networks – directly off your #nextlevelnails . Noah Travis Phillips is an artist and investigator. He is in the 2nd half of his MFA at the University of Denver in Emergent Digital Practices (EDP), a highly innovative program existing at the dynamic convergence of art & technology. His research centers on appropriation and digital/analog collage and montage methodologies. Phillips is interested in hybridizing high and low culture, ecologies as models for art-making, and human interpretation in contrast to machinic processing.He performed in the 2015 Biennial of the Americas. He has exhibited work across the U.S. He has work in public and private collections. His most recent exhibition was at Dateline in Denver. He currently lives and works in Boulder, Colorado. In an expansive and multiplex space fictional mechanical gods hold in their palms a “formula-to-decimate-worlds” & “formula-for-world-destruction”. Humans are folding space at the quantum level, traveling profound distances through amplified intuition. The chaotic and non-deterministic quantum nature of this wide-ranging space invites the viewer on an expedition, outer space exploration as inner space exploration. The images are arranged like a concrete poem. The arrangement is as important in conveying the meaning as the content of the images. pattern-formula-magic-script-folding-space is one in a series of panoramic singular web pages, spread out like scrolls. They seek to access larger cultural dialogues through a montage of highly subjective symbolic imagery. The particular experience is up to the viewer’s adventurous spirit. The awe-striking power of virtual reality is evident to most anyone who tries it: a visceral feeling of being immersed in a fantasy, a full body epiphany one must experience first hand to believe. For the members of PIMG, these technologies represent nascent possibilities igniting our imagination. We see them as precipitating a paradigm shift toward a new era of multi-sensory communication, with uniquely empathic, beatific, and therapeutic potential. Offsetting this promise however are questions of access, accountability, privacy, and human transmutability: who will have means to these technologies? How will individuals be altered or compromised by their use? Will continued reliance on high-priced software and hardware result in asymmetrical communication in the metaverse? It’s this sort of criticality which PIMG brings to public discourse through ardent experimentation, immersive realm building, critical writing, and visceral installations that bridge the virtual and the physical. Ontology of Objects explores the nature of objecthood. In what sense do objects exist? The ability to conjure virtual objects from the void of 3D modeling space is nothing new but virtual reality makes those same objects everything short of tangible. As haptic technology improves along with other means of sensory deception does our standard for ‘reality’ becomes less distinct? Did you know that all known and unknown objects actually live on store shelves under a majestic temple on a placid lake surrounded by nonexistent mountains? LPDMMM is the little post-dinner mood music machine. Will Bryant is an artist and designer based in Austin, TX. His work weaves together humor with commerce, fun, and positivity. In his sculptural installations, photographic still lives, and commercial illustration projects, there is always a sense of exuberance at play with a colorful palette. His work has been plastered across advertising campaigns, t-shirts, record sleeves, posters, magazines, furniture, snowboards, underwear, and also exhibited internationally. In 2013 he was awarded as a Young Gun by the Art Directors Club. Zak Loyd (Texan, 1986) is a multimedia artist and educator interested in the mystical ramifications of archaic and contemporary video technologies. Having come to know the world via the warm, glowing depths of a CRT television, Zak’s work attempts to revisit a psychic singularity through formal video compositions crafted and presented as esoteric ritual. His intermodal work takes the form of installation, performance, and network based compositions. He has shown locally and internationally at The Museum of Contemporary Art Denver, Rhizome at The New Museum, Echo Park Film Center, Casa Maauad in Mexico D.F. and Videofag in Toronto. He is currently teaching Digital Art at the University of Colorado and living in Boulder, Colorado. Selected works can be viewed at iremembertheinter.net or zakloyd.com. solve/coagula.html is a private, esoteric temple for your personal computer’s internet browser!